If the defeat of one member of Congress could change the entire dynamic in Washington, and restore America to constitutional government, that member of Congress would be Speaker of the House Paul Ryan. As we explained in our article, “Paul Ryan: Now the Ugly Face of the GOP Establishment,” how Wisconsin Congressman Paul Ryan went from budget-balancing conservative wunderkind, to GOP vice presidential nominee, to channeling Nancy Pelosi when he snarled, “It’s declassified and made public once it’s agreed to,” as he tried to sell Obama’s Trade Promotion Authority and Trans-Pacific Partnership treaties to skeptical conservatives during Rules Committee testimony is one of Washington’s saddest tales of how DC’s inside elite capture talent and bend it to their will. None of the promise of Ryan’s early rise has panned out now that he is Speaker. Ryan also advocated “truth in budgeting” and criticized the Democrats for their blue smoke and mirrors accounting tricks intended to hide the real numbers and the extent of the annual deficit from the American people. Ryan’s creative thinking on the budget was refreshing, but many conservatives were skeptical and critical of a plan that took 30 years to balance the budget, pointing out that it would span some 15 congressional election cycles. Conservative skepticism of Ryan’s plan was later proven correct as Ryan embraced breaking the spending caps agreed to in the 2011 deal to raise the debt ceiling after just one congressional election cycle, thereby increasing spending and the deficit even as tax collections rose to record levels. But what’s even worse than Ryan’s abandonment of his “truth in budgeting” and economic growth agenda is his abandonment of Wisconsin’s working families in favor of the globalist agenda of open borders and uneven trade deals, like NAFTA and the TPP, favored by billionaires such as Mark Zuckerberg and George Soros. Paul Ryan’s agenda, particularly since he became Speaker, has been one of open borders, expansion of visa programs, and crony international trade deals – all policies that undermine American industries, jobs, and the quality of life for American workers. Unsurprisingly, Paul Ryan’s campaign coffers are now overflowing with money from the Wall Street – Washington – Silicon Valley Axis – and other interests that would benefit from a steady stream of cheap, interchangeable labor from wherever they can get it. Fortunately, the voters in Wisconsin’s First Congressional District have a strong and viable alternative in businessman and entrepreneur Paul Nehlen. Nehlen has mounted a strong grassroots effort to #DumpRyan that has attracted support from across the country and hit thousands of doors in Wisconsin 1. In his arrogant dismissal of conservative populist concerns about Obama’s secret trade deal, in his outright lies about its provisions, and especially in his angry advocacy of establishment Republican corporatism that would continue the destruction of the aspirations of America’s working families, blindly hand President Obama the power to deal away American sovereignty and bypass Congress on a host of issues from expanding immigration to “climate change,” we think, after 18-years, Paul Ryan has disqualified himself from representing the people of Wisconsin Congressional District 1. The Wisconsin Republican primary election is August 9, just a week from today. 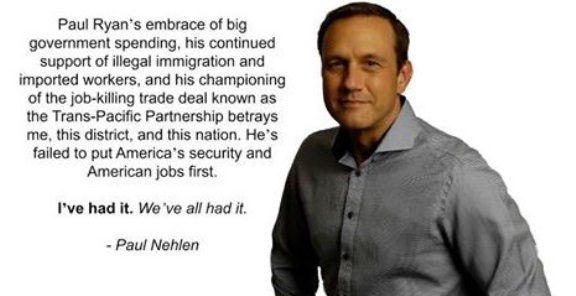 We urge limited government constitutional conservatives and all other voters in Wisconsin Congressional District 1 who want a Congressman who represents the interests of American workers and their families to go to the polls on August 9 and vote for Paul Nehlen to replace Paul Ryan as their Representative in Congress. Submitted by Holland180 on Fri, 08/05/2016 - 12:58. I would welcome Paul Nehlen to win over Ryan. I never wanted Ryan for Speaker and the way he has nic pic on Trump has helped Hillary. Remember when asked early on if he would support Trump he stated he was not just ready yet.....Now Trump gives him back a dose of the same statement. Ryan is part of the GOP faction to beat their republican candidate???? They might just as well come out and support Hillary because that is what they are doing by failing to get 100% behind the Republican nominee. Submitted by highlandsdesign on Thu, 08/04/2016 - 12:28. If Mr. Ryan will not address the NUMBER ONE issue facing America, i.e., an "illegal alien" parading as President, what makes anyone think he can be a leader on any other issue ??? Hey, I love cheese as much as any one, but C'MON WISCONSIN, get your "whey" together and get rid of this guy. Submitted by email_registrat... on Wed, 08/03/2016 - 07:18. I agree completely. Lyin' Ryan has to go! He has a huge wall around his property, but he does not think we AMERICAN CITIZENS deserve to be protected. I am so sick of these people taking tax payer dollars for their salaries and then betraying us AMERICAN CITIZENS and supporting illegals!!! That is disgusting and reprehensible. Submitted by jwagner on Tue, 08/02/2016 - 11:55. Kudos to Paul Nehlen and Richard Viguerie. I could not agree more on all that they say. I'm sure Trump will have something to say about Paul Ryan as well. We must endorse Trump 100% and NOT be one of those half-hearted Trump supporters who cling to the idea of "Anyone But Hilliary." I believe in "Unconditional Surrender" -- just as Churchill did in WWII. Submitted by email_registrat... on Thu, 08/04/2016 - 08:34. With all the corrupted hypocrite politicians, both Democrats and Republicans, who can we really trust? How do we know who is being honest and who is not? Paul Ryan, in my opinion is a real hypocrite; a two face character. Therefore I would take the chance on Paul Nehlen. Submitted by LEL MN on Wed, 08/03/2016 - 11:26. Another "public servant" who sold his soul for personal gain.